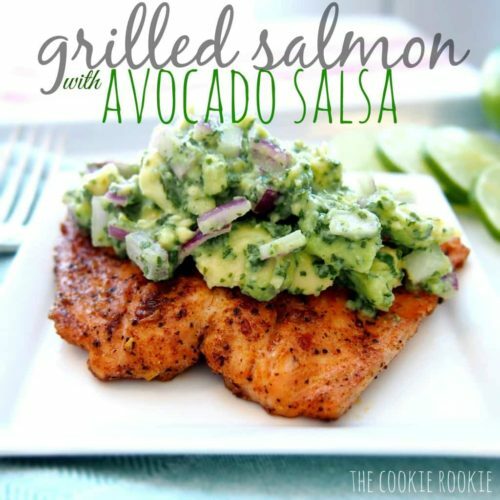 My sister found this yummy grilled salmon recipe to share with everyone. Her notes are that the salt in the rub made it WAY too salty, so we’re recommending that you leave the salt out entirely. My notes are that I imagine this working with whatever your favorite protein is – any fish, chicken, even a tofu steak or tempeh patty! To make it even quicker, perhaps try my favorite Trader Joe’s pre-made guacamole instead. You don’t need a grill – stove top in a pan would work fine. You could serve it with beans in a tortilla (or lettuce leaf), or on top of a salad! It seems very versatile. Here’s a link to the original recipe, but I’m putting it below with our suggested changes. Mix the chili powder, cumin, paprika, onion and black pepper together, rub the salmon fillets with olive oil and this seasoning mix. Combine the avocado, onion, cilantro, lime juice, and salt in a bowl and mix.